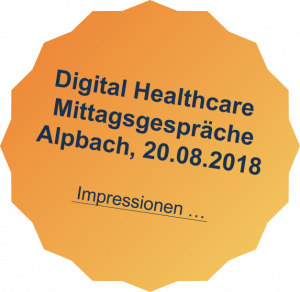 Telegesundheitsdienste in Tirol, Steiermark und der VAEB – Übersicht März 2018, AIT Austrian Institute of Technology GmbH. A small-scale randomised controlled trial of home telemonitoring in patients with severe chronic obstructive pulmonary disease; Journal of Telemedicine and Telecare, 23(7) (2017), S. 650 – 656. A. Hameed, R. Modre-Osprian, G. Schreier: Identification of Cost Indicators with Significant Economic Impact on the Total Treatment Costs of Chronic Heart Vailure Patients – A Meta-Analysis; Vortrag: eHealth2017 – Health Informatics meets eHealth, Wien; 23.05.2017 – 24.05.2017; in: „Health Informatics meets eHealth„, IOS Press, 236 (2017), 978-1-61499-759-7/1879-8365; S. 161 – 168. Vortrag: eHealth2017 – Health Informatics meets eHealth, Wien; 23.05.2017 – 24.05.2017; in: Health Informatics meets eHealth; IOS Press, 236 (2017), ISBN: 978-1-61499-759-7; S. 298 – 304. A. Eggerth, R. Modre-Osprian, D. Hayn, P. Kastner, G. Pölzl, G. Schreier: Comparison of Body Weight Trend Algorithms for Prediction of Heart Failure Related Events in Home Care Setting. Stud Health Technol Inform. 2017;236:219-226. Stud Health Technol Inform. 2016;223:281-8. Electronic Patient Reported Outcomes in Paediatric Oncology – Applying Mobile and Near Field Communication Technology. Duregger K, Hayn D, Nitzlnader M, Kropf M, Falgenhauer M, Ladenstein R, Schreier G.
Stud Health Technol Inform. 2016;223:237-44. Continual Screening of Patients Using mHealth: The Rolling Score Concept Applied to Sleep Medicine. Zluga C, Modre-Osprian R, Kastner P, Schreier G.
Stud Health Technol Inform. 2016;221:118. Internet of Things Based Medication Adherence Assessment. Ebner H, Hayn D, Kropf M, Modre-Osprian R, Schreier G.
Conf Proc IEEE Eng Med Biol Soc.2015 Aug;2015:6848-51. doi: 10.1109/EMBC.2015.7319966. An mHealth system for toxicity monitoring of paediatric oncological patients using Near Field Communication technology. Duregger K, Hayn D, Morak J, Ladenstein R, Schreier G.
Methods Inf Med. 2015 Oct 12;54(5):388-97. Evaluation of an Integrated Telemonitoring Surveillance System in Patients with Coronary Heart Disease. Ammenwerth E, Woess S, Baumgartner C, Fetz B, van der Heidt A, Kastner P, Modre-Osprian R, Welte S, Poelzl G.
Stud Health Technol Inform. 2015;212:81-7. Evaluation of a Clinical Decision Support Rule-set for Medication Adjustments in mHealth-based Heart Failure Management. Kropf M, Modre-Osprian R, Gruber K, Fruhwald F Schreier G.
Stud Health Technol Inform. 2015;212:57-64.Textual Analysis of Collaboration Notes of the Telemedical Heart Failure Network HerzMobil Tirol. Modre-Osprian R, Gruber K, Kreiner K, Schreier G, Poelzl G, Kastner P.
Stud Health Technol Inform. 2015;212:50-6. A Personalized Feedback System for Supporting Behavior Change for Patients After an Acute Myocardial Infarction. Kreiner K, Welte S, Modre-Osprian R, Fetz B, Heidt A, Kropf M, Ammenwerth E, Pölzl G, Kastner P.
Stud Health Technol Inform. 2015;212:35-42. Development of Text Mining Based Classification of Written Communication within a Telemedical Collaborative Network. Gruber K, Modre-Osprian R, Kreiner K, Kastner P, Schreier G.
JOINT RESEARCH CENTRE – The European Commission’s in-house science service, 2015. Strategic Intelligence Monitor on Personal Health Systems Phase 3 (SIMPHS3). Diabmemory (Austria). Case Study Report. PEINADO Ignacio, VILLALBA MORA Elena, MANSOA Francisco Jose, SANCHEZ Alberto, RODRIGUEZ MANAS Leocadio, GRAAFMANS Wilhelmus Cornelis, ABADIE Fabienne. Wiener Klinische Wochenschrift. 2014 Nov 13. HerzMobil Tirol network: rationale for and design of a collaborative heart failure disease management program in Austria. Von der Heidt A, Ammenwerth E, Bauer K, Fetz B, Fluckinger T, Gassner A, Grander W, Gritsch W, Haffner I, Henle-Talirz G, Hoschek S, Huter S, Kastner P, Krestan S, Kufner P, Modre-Osprian R, Noebl J, Radi M, Raffeiner C, Welte S, Wiseman A, Poelzl G.
Stud Health Technol Inform. 2014;198:17-24. Closed-loop healthcare monitoring in a collaborative heart failure network. Modre-Osprian R, Pölzl G, Von Der Heidt A, Kastner P.
Appl Clin Inform. 2014 Jul 2;5(3):612-20. doi: 10.4338/ACI-2014-04-RA-0037. eCollection 2014. The impact of adherence on costs and effectiveness of telemedical patient management in heart failure: a systematic Review. Hameed AS, Sauermann S, Schreier G.
Methods Inf Med. 2014 Oct 13;53(5):336-43. doi: 10.3414/ME14-01-0040. Epub 2014 Jun 6. Memorandum on the use of information technology to improve medication safety. Ammenwerth E, Aly AF, Bürkle T, Christ P, Dormann H, Friesdorf W, Haas C, Haefeli WE, Jeske M, Kaltschmidt J, Menges K, Möller H, Neubert A, Rascher W, Reichert H, Schuler J, Schreier G, Schulz S, Seidling HM, Stühlinger W, Criegee-Rieck M.
Stud Health Technol Inform. 2014;200:179-81. Personal health systems research – charting the European landscape. Schreier G, Amanatidou E, Heller-Schuh B, Giesecke S, Miles I, Pompo-Juarez L, Saritas O, Schartinger D.
Stud Health Technol Inform. 2014;200:22-31. The internet of things for personalized health. Schreier G.
Stud Health Technol Inform. 2014;198:v-vi. Successful health-IT–just the use of information and communication technology (ICT) in healthcare? Hörbst A, Hayn D, Schreier G, Ammenwerth E.
Stud Health Technol Inform. 2014;198:238-44. Integrated medication management in mHealth applications. Ebner H, Modre-Osprian R, Kastner P, Schreier G.
Conf Proc IEEE Eng Med Biol Soc. 2013;2013:7270-3. doi: 10.1109/EMBC.2013.6611236. Design and evaluation of a multimodal mHealth based medication management system for patient self administration. Schreier G, Schwarz M, Modre-Osprian R, Kastner P, Scherr D, Fruhwald F.
Biomed Tech (Berl). 2013 Sep 7. pii: /j/bmte.2013.58.issue-s1-K/bmt-2013-4251/bmt-2013-4251.xml. doi: 10.1515/bmt-2013-4251. Mhealth Supporting Dynamic Medication Management during Home Monitoring of Heart Failure Patients. Modre-Osprian R, Hayn D, Kastner P, Schreier G.
Br J Clin Pharmacol. 2013 Sep;76 Suppl 1:47-55. doi: 10.1111/bcp.12184. Mobile health (mHealth) based medication adherence measurement – a pilot trial using electronic blisters in diabetes patients. Brath H, Morak J, Kästenbauer T, Modre-Osprian R, Strohner-Kästenbauer H, Schwarz M, Kort W, Schreier G.
Conf Proc IEEE Eng Med Biol Soc. 2012;2012:272-5. doi: 10.1109/EMBC.2012.6345922. Feasibility of mHealth and Near Field Communication technology based medication adherence monitoring. Morak J1, Schwarz M, Hayn D, Schreier G.
J Telemed Telecare. 2012 Dec;18(8):476-80. doi: 10.1258/jtt.2012.GTH112. Epub 2012 Dec 3. Web versus app: compliance of patients in a telehealth diabetes management programme using two different technologies. Schreier G, Eckmann H, Hayn D, Kreiner K, Kastner P, Lovell N.
IEEE Trans Inf Technol Biomed. 2012 Jan;16(1):17-23. doi: 10.1109/TITB.2011.2176498. Epub 2011 Nov 18. Design and evaluation of a telemonitoring concept based on NFC-enabled mobile phones and sensor devices. Morak J, Kumpusch H, Hayn D, Modre-Osprian R, Schreier G.
Acta Derm Venereol. 2011 Oct;91(6):680-5. doi: 10.2340/00015555-1148. Teledermatological monitoring of psoriasis patients on biologic therapy. Koller S, Hofmann-Wellenhof R, Hayn D, Weger W, Kastner P, Schreier G, Salmhofer W.
Appl Clin Inform. 2011 Nov 23;2(4):481-98. doi: 10.4338/ACI-2010-12-RA-0078. Print 2011. Near Field Communication-based telemonitoring with integrated ECG recordings. Morak J, Kumpusch H, Hayn D, Leitner M, Scherr D, Fruhwald FM, Schreier G.
Stud Health Technol Inform. 2010;161:86-94. Feasibility of a mobile anticoagulation telemedicine system using automated decision support. Kreiner K, Morak J, Pinsker M, Edegger K, Schreier G.
Stud Health Technol Inform. 2010;160(Pt 2):1344-8. A mobile phone based telemonitoring concept for the simultaneous acquisition of biosignals physiological parameters. Kumpusch H, Hayn D, Kreiner K, Falgenhauer M, Mor J, Schreier G.
Appl Clin Inform. 2010 Jun 16;1(2):165-76. doi: 10.4338/ACI-2009-12-RA-0021. Print 2010. Innovative telemonitoring system for cardiology: from science to routine Operation. Kastner P, Morak J, Modre R, Kollmann A, Ebner C, Fruhwald F, Schreier G.
Stud Health Technol Inform. 2009;150:468-72. Mobile phone-based teledermatologic compliance management – preliminary results of the TELECOMP study. Hayn D, Koller S, Hofmann-Wellenhof R, Salmhofer W, Kastner P, Schreier G.
J Med Internet Res. 2009 Aug 17;11(3):e34. doi: 10.2196/jmir.1252. Effect of home-based telemonitoring using mobile phone technology on the outcome of heart failure patients after an episode of acute decompensation: randomized controlled trial. Scherr D1, Kastner P, Kollmann A, Hallas A, Auer J, Krappinger H, Schuchlenz H, Stark G, Grander W, Jakl G, Schreier G, Fruhwald FM; MOBITEL Investigators. Conf Proc IEEE Eng Med Biol Soc. 2008;2008:5338-41. doi: 10.1109/IEMBS.2008.4650420. A mobile-phone based teledermatology system to support self-management of patients suffering from Psoriasis. Schreier G, Hayn D, Kastner P, Koller S, Salmhofer W, Hofmann-Wellenhof R.
Conf Proc IEEE Eng Med Biol Soc. 2008;2008:5334-7. doi: 10.1109/IEMBS.2008.4650419. Electronic data capture platform for clinical research based on mobile phones and near field communication technology. Morak J, Schwetz V, Hayn D, Fruhwald F, Schreier G.
J Telemed Telecare. 2008;14(3):147-9. doi: 10.1258/jtt.2008.003015. A pilot study of mobile phone-based therapy for obese patients. Morak J, Schindler K, Goerzer E, Kastner P, Toplak H, Ludvik B, Schreier G.
J Telemed Telecare. 2007;13(7):341-7. Feasibility of a telemedicine framework for collaborative pacemaker follow-up. Kollmann A, Hayn D, García J, Trigo JD, Kastner P, Rotman B, Tscheliessnigg K, Schreier G.
J Med Internet Res. 2007 Dec 31;9(5):e36. doi: 10.2196/jmir.9.5.e36. Feasibility of a mobile phone-based data service for functional insulin treatment of type 1 diabetes mellitus patients. Kollmann A, Riedl M, Kastner P, Schreier G, Ludvik B. Stud Health Technol Inform. 2007;129(Pt 1):112-6. Feasibility and usability of a home monitoring concept based on mobile phones and near field communication (NFC) technology. Morak J, Kollmann A, Schreier G.
J Telemed Telecare. 2006;12(5):255-61. Mobile phone-based surveillance of cardiac patients at home. Scherr D, Zweiker R, Kollmann A, Kastner P, Schreier G, Fruhwald FM.